Have you taken a trip recently? No matter where you have visited, you always go home with tons of photos. This Let's Go Collection from ComputerGeek is just right for you to organize the photos when memories are still fresh. 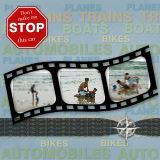 Anytime is the perfect time to preserve all your special memories with your family and friends. This Vintage Travel Collection from Nessa73 is ideal to create some timeless pages of all your travels throughout the year. 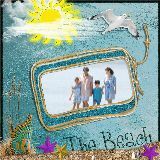 Whether you are reminiscing about a recent beach trip or planning an upcoming trip, this Beach Collection from Lisadee is a great way to really capture the memory. You can almost feet the crisp sea air and hear the crashing waves. Escape to the Islands even if it is only in your Dreams with this Hawaiian Dream Collection from Nayyan. The bright colors and floral embellishments are sure to put you in a tropical mood. Even if you can’t make it to the Caribbean this summer, you can feel like you are there with this Caribbean Summer Collection from Monja. So, soak up some rays no matter where you are, relax and take a break from it all. Sail away with this great travel collection from Gypsie. Navigate to a more relaxing and peaceful place even if it is just in your memories. It may even inspire you to plan a new trip.